Tiablo A7 Review: RUNTIMES, BEAMSHOTS, DETAILED PICS and more! Thread: Tiablo A7 Review: RUNTIMES, BEAMSHOTS, DETAILED PICS and more! Reviewer's Note: The A7 was provided for review by Tiablo. Please see their CPFMP sales thread for more info. 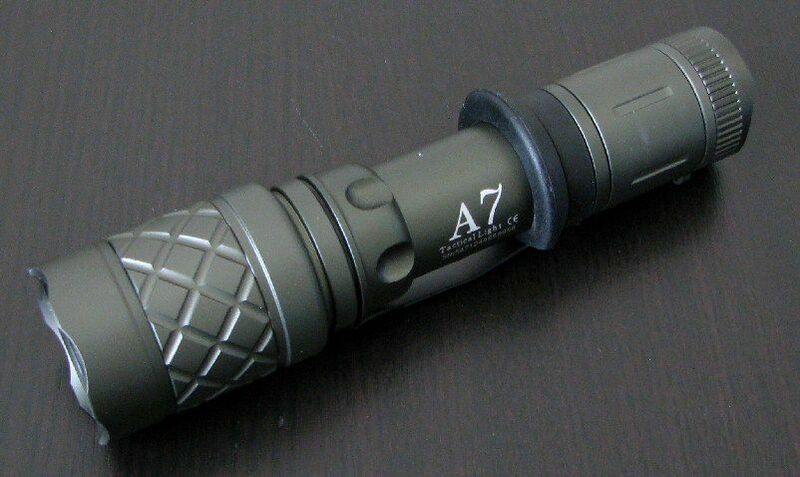 The A7 is the latest general-purpose “Tactical” 2xCR123A light from Tablo. As you will see, there are a number of similarities to other recent lights in this class. But there are a few distinctive aspects to this build. The A7 comes with fairly standard set of Tiablo accessories - manual, warranty card, spare o-rings, good quality wrist lanyard, and belt pouch. There's also an extra rubber body ring/screw-thread cover. As you can see, Tiablo is also developing an optional set of filters. 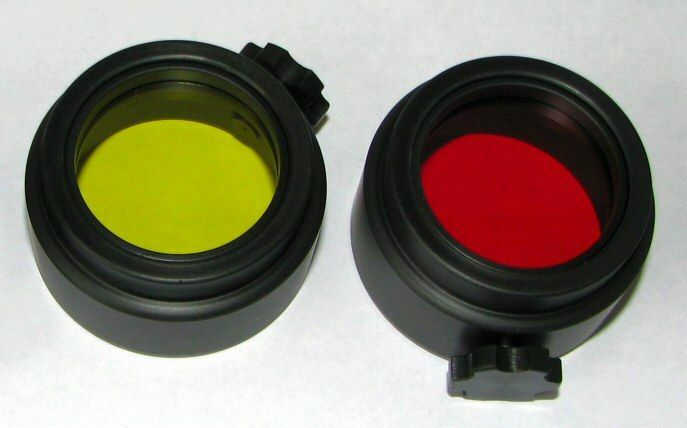 Shown above is the yellow and red filter covers. These attach over the head of the light, with a screw to tighten them in place. 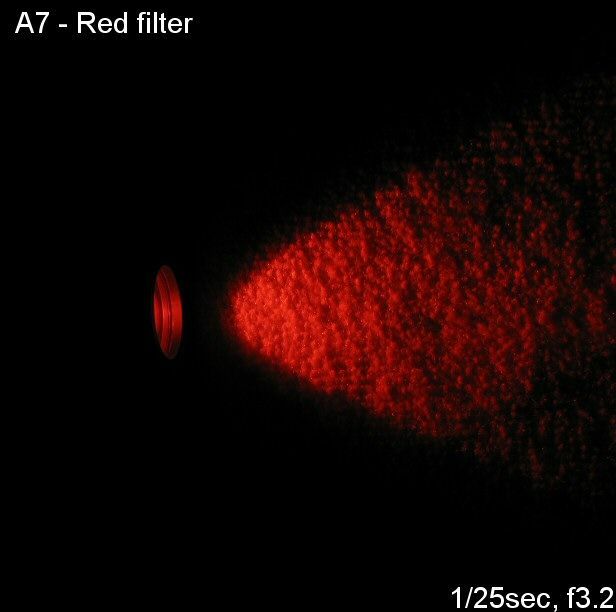 The filters are of high quality, with a good solid feel (scroll down for beamshots). 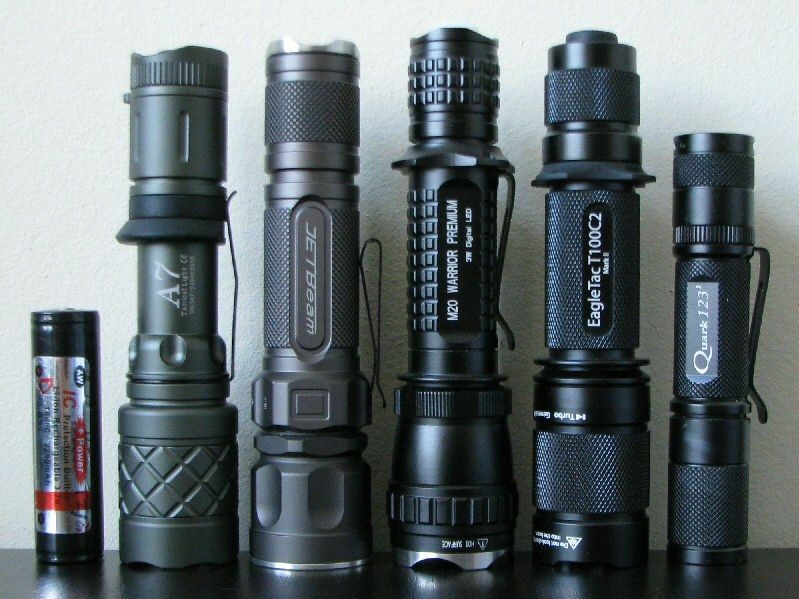 (from left to right: AW protected 18650, Tiablo A7, JetBeam Jet-III M, Olight M20, EagleTac T100C2 MarkII, Quark Q123-2). The overall size and weight is certainly within the range of other lights of this class – possible a touch shorter than typical. The diameter of the head is about 32mm (i.e. just under 1.25 inches). This means the filter accessories for the A7 should also fit other lights with a similar size head (e.g. Surefire 6P, although I don't have one to test). I have tested the filters on my NiteCore SR3 and DarkTort ET1.0, and they are a perfect fit. The components and overall build quality seem high. The reflector and emitter are easily accessible. Note the springs in both the head and tailcaps – meaning newer flat-top high-capacity 18650s should work fine. Fit and finish are excellent on my sample, no flaws in the olive drab type-III hard anodizing. The olive drab color is certainly distinctive - I don't believe the A7 is being offered in other color choices. The light doesn’t really have knurling, but the various design elements do help with grip (note the removable clip and grip ring). Identification labels are very sharp and clear, in bright white against the OD background. Tailcap screw threads are anodized for lock-out. UPDATE OCTOBER 6, 2009: I've checked, and the A7 threading diameter is the same as the Tiablo A10-G and ACE-G. This means that the ACE-G extension battery tube will also thread on the A7, potentially allowing 2x18650 operation. 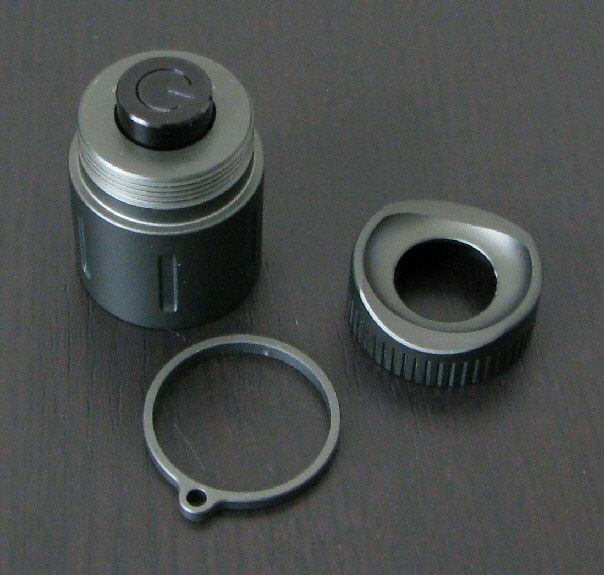 The tailcap region is fairly unique, as the components can easily be disassembled to suit your preferred use. The stainless steel lanyard ring can be easily removed, although it leaves a gap if you do not also remove the external tailcap cover. Just personal preference, but I prefer to leave the lanyard ring off as it rotates freely (i.e. spins around on its own, which is a bit distracting). Interestingly, thanks to the built-up ridges of the removable external tailcap cover, the light can tailstandand (uncommon for a forward-clicky tactical light). And I still find the switch fairly easy to access with it on – good job on this feature. 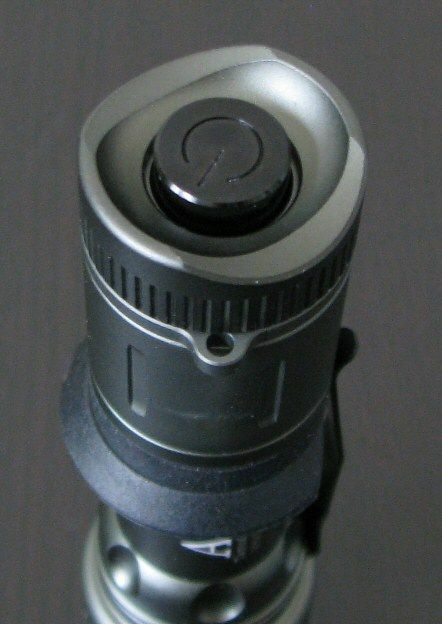 The tailcap switch design is similar to the earlier Tiablo TL-1. The button cover is made of aluminum, and is thus quite distinctive (and fairly stylish ) - similar to the earlier Tiablo TL-1. But like that light, I am not a fan of the actual switch feel – it is fairly soft and “squishy”, with a long traverse. If you do not press the switch dead-on, there’s a chance of too much lateral movement, preventing activation. My A7 sample came with a fairly heavily textured reflector. That should help with minimizing Cree rings, given that the light uses the standard Cree XR-E emitter (R2 output bin). Tint was a premium cool white on my sample. For those of you not familiar with tint bins, please see my Colour tint comparison and the summary LED tint charts found here. And now for the requisite white wall wanting hunting … all lights are on Max on an AW protected 18650, about 0.5 meters from a white wall. As you can see, the A7 has a very wide spillbeam, greater than most lights. Consistent with this, it also has less throw than other lights. Simply put, the A7's reflector is wide but shallow, compared with a lot of lights that go for deeper reflectors (which produce greater throw but narrower spill). The heavily textured reflector clearly helps reduce rings in the beam. 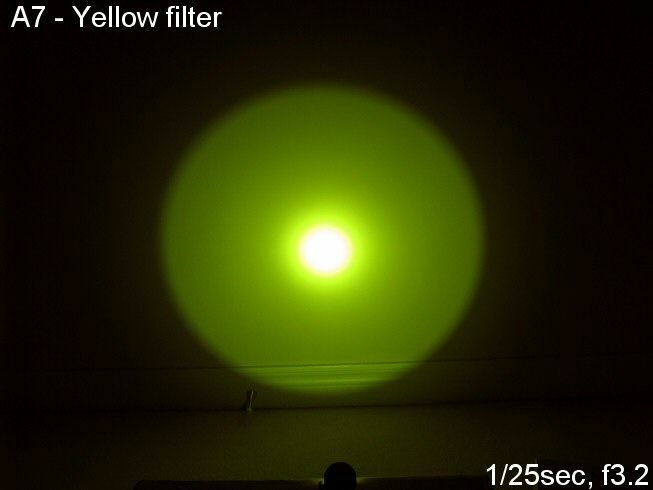 Note that the yellow filter is a very sharp yellow color in real life – my camera seems to be tinting the images somewhat green. 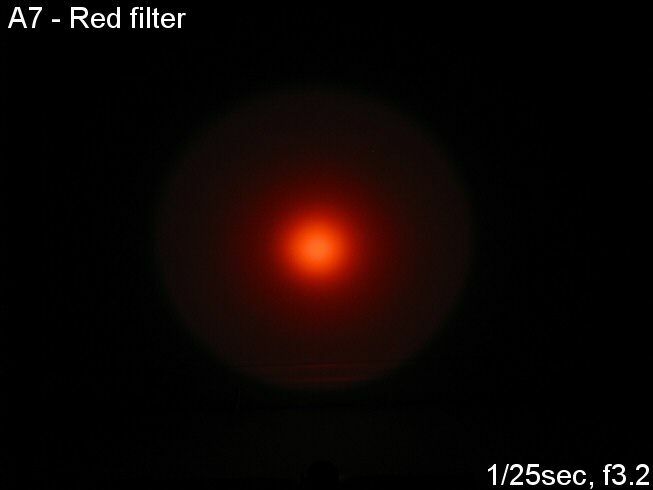 As expected, the red filter lets through less light (consistent with the relatively lower level of red wavelengths in white LED emitters). The A7 has a distinctive interface. It has two user-selectable modes, A and B.
Mode A is a simple Hi output. That’s it – press for momentary on, click for lock on. You can signal using the forward clicky without worrying about changing modes. Mode B is a three-stage light: Hi, Lo, Strobe. You switch between stages in continuous sequence by soft-pressing on the clicky or turning the light off-on rapidly. There is stage memory, which according to the manual is 5-secs for it to memorize the setting after turning off. But in my testing, it is (thankfully) much shorter - more like ~2 secs for it to memorize. Less than that and the light will advance to the next stage upon reactivation. Hi is the same output level as the single-stage mode. To switch between Modes A & B, you need to turn off the light, wait 2 secs, and then do 3 rapid on/off flashes or full clicks of the tailcap switch within ~1.5 secs. Note that you are unlikely to do this accidentally – timing is very, very tight. You will also not have any visual feedback that your clicks are registering during this short period (i.e. the light stay dark - see comments below). As such, I recommend you do the complete on-off-on-off-on sequence with enough force so that the 5 actual clicks are heard, to make sure you actually switch modes as intended. As you may imagine, this leads to an unusual quirk when normally re-activating the light. To use Mode B as an example, if you flash the light off-on in 1 sec or less, the light simply comes on immediately in the next level (i.e. advances forward, as expected). If you wait >3 secs, the light immediately comes on in the memorized, saved state you left it. So far so good. But if you wait between ~1.5-3 secs before turning back on, there is a pause before the light re-illuminates, while it considers if you are trying to switch modes. If you are not doing a mode switch (i.e. 3 rapid full switches, 5 actual "clicks"), then it will eventually come on in the original saved state once the time period for switching expires. This ~1.5 sec delay is understandable when you think of how the mode-switching circuit works, but it is a little peculiar if you are not expecting it. UPDATE SEPT 11, 2009:It looks like my guess that the activation delay was caused by the mode-switching behavior of the circuit is correct. Tiablo has confirmed that the simplest way to reliably switch between modes A & B is to insure 5 clicks off or on are clearly registered during this pause period. I have updated the text above to make this clearer. There is a low-voltage warning that kicks in to warn you the cells are near depletion. 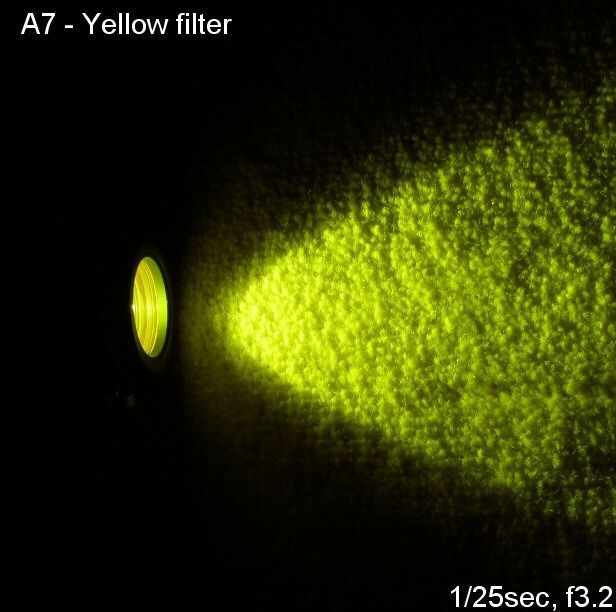 This signal is a simple series of 3 1sec bursts of strobing, with 5 secs delay in-between. It does not repeat, unless you turn off and re-activate the light. On 18650, I found this signal was set off when the light had decayed to ~25% of max output, or just over 2.9V. Strobe frequency was measured at 16.2Hz, which is certainly very “tactical” in my books. I am not sure if the A7 circuit uses PWM for its low modes. Although my home-made oscilloscope sound card was able to detect a signal in the 4-5 kHz range on Hi and Lo, this may be a circuit artifact as opposed to actual PWM (I am not able to resolve traces at that timescale to confirm). Based on the performance (see output/runtimes below), I suspect the circuit is actually current-controlled (i.e. efficiency seems comparable to some of the recent EagleTac lights). Testing Method: All my output numbers are relative for my home-made light box setup, a la Quickbeam's flashlightreviews.com method. You can directly compare all my relative output values from different reviews - i.e. an output value of "10" in one graph is the same as "10" in another. All runtimes are done under a cooling fan. As you can see, the output for the A7 on Hi is certainly respectable for a multi-power light, on all batteries. It is not the absolute brightest of its class – scroll down to the runtimes to see a possible explanation as to why. Throw is toward the low end for this class of light, consistent with the wide but shallow reflector (i.e. casts a wider spillbeam). Note: all 18650 runtimes were performed on AW protected 2200mAh 18650. The explanation for the slightly reduced max output quickly becomes apparent – the light is extremely well regulated on all battery sources, at both levels (with consistent output across batteries). As you can see in the Hi mode 18650 runtime graph, it is very hard for most multi-power lights to be fully regulated on 18650 when driven to very high output levels. The A7 is certainly a shinning example of fully regulated output. Overall output/runtime performance is very good, and efficiency seems remarkably consistent with the EagleTac T100C2 and T20C2. This leads me to suspect the A7 uses a similar a current-controlled circuit. Although not shown in the traces above, I did notice the low voltage warning when activating the light on nearly depleted 2xCR123A or 1x18650 (i.e. a series of three 1-sec strobes every 5 secs). In Mode B, the Lo level is really more of a Med level, and you have to put up with having strobe in the same sequence. Because of how the circuit determines if you trying to switch between modes A & B, there is a delay in re-activation of the light between ~1.5-3 secs after turning it off (i.e. light stays dim for ~1-2 secs before coming back on at the saved level). Fortunately, there is no such delay <1.5 sec or >3 sec (i.e. light activates immediately within its current state as expected). It is during the pause period that you need to rapidly flash on/off 3 times to switch modes. The switch has “softer” feel than most, with a longer traverse. I found it occasionally wouldn't activate if too much lateral pressure was applied (i.e. need to hit it head-on). The A7 is a well-balanced general-purpose light in the 2xCR123A/1x18650 space. Somewhat "medium-sized" for recent lights in this class, I find the A7 has a fairly solid and rugged feel, consistent with its intended "tactical" audience. There are a lot of nice design touches that show that Tiablo has put some thought into the use of this light. Physically, the removable clip, grip ring, lanyard ring, and tailstanding switch cover are all most welcome. Note that you might find the light a bit slippery if all of these were removed, as there is no real knurling to speak off (i.e. 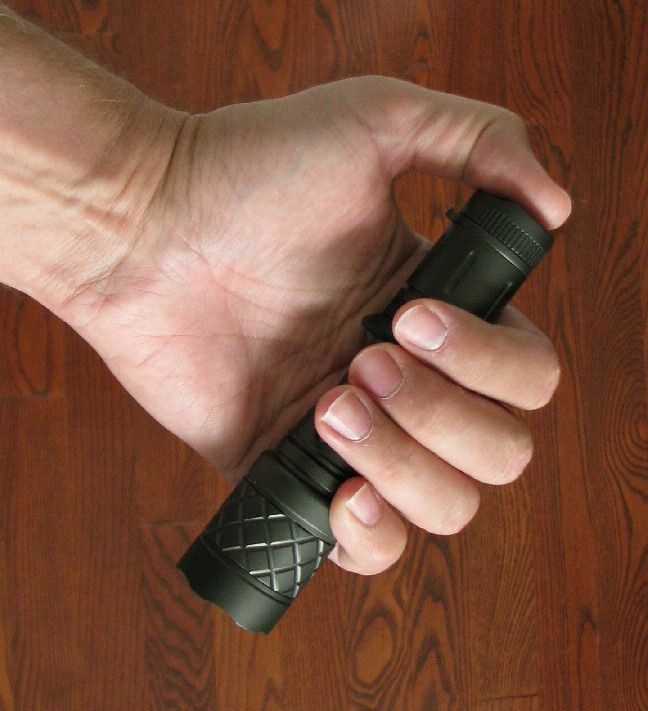 the light relies on its shape and various body design elements to help with grip). 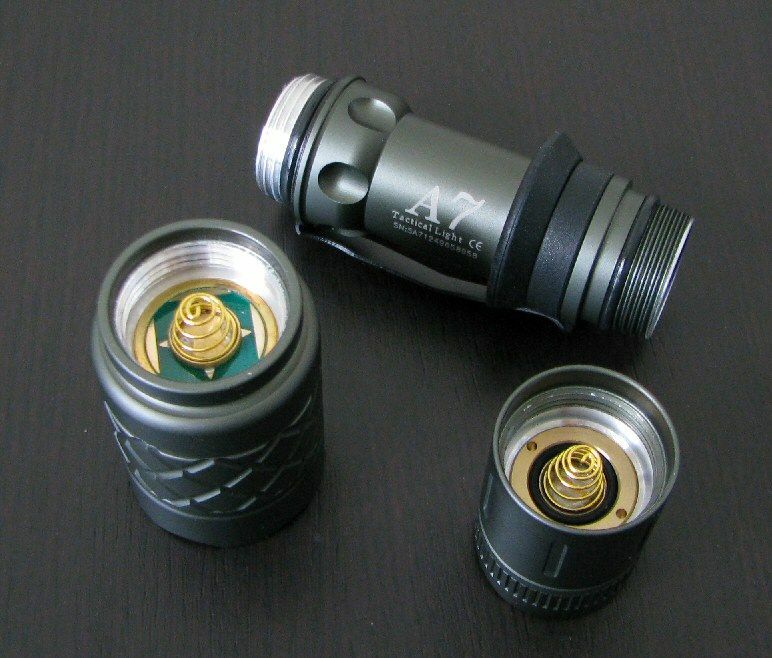 Internally, the lock-out tailcap and wide bore capacity for protected 18650s are appreciated. And the dual springs on the head and tail contact surfaces mean that newer high-capacity flat-top 18650s should work fine. The fairly standard 32mm/1.25inch bezel opening means a lot of lens accessories will fit, and Tiablo has already stocked good quality red and yellow filters for resale (although I would strongly recommend they add a diffuser to the mix). Their filters have a nice snug fit that doesn't allow any significant light to escape around the head. The heavily textured reflector does a great job in reducing the dreaded Cree rings in the beam. My only real complaint with the build is the tailcap switch feel. Like on the earlier TL-1, I find this switch too soft and "squishy" for my tastes. I like a crispier switch with immediate tactile feedback and responsiveness. The switch itself work reliably in my testing – it's really just a feel and use issue. Circuit performance is remarkably similar to the recent EagleTac tactical lights in this space – although with even better regulation on 18650. Frankly, this is an impressive showing for the A7 – it is very hard to produce such strong regulation on Hi on 18650 in a multi-power light. Output levels are spaced at reasonable levels for a 2-stage light (although I'm sure a lot of people who have liked an additional true Lo mode). But if you are going to go with a simple 1-stage or 2-stage light, then these are the efficiency levels I like to see. The user interface on the A7 is distinctive – and while certainly serviceable, it is a bit quirky in mode switching and memory timings. I don't know the source of the activation delay between ~1.5-3 secs following turn off in Mode B, but it is a little confusing. Ideally, I would also like to see a mode where the light has Lo-Med-Hi with no strobe - and the Lo is a true Lo mode (maybe a Mode "C"?). But as always, it all comes down to how you like to use the light – fans of the single-stage Hi mode with momentary signaling, or the Hi-Med-Strobe sequence, may very well find the UI perfectly good as is. Bottom line, we have another strong contender in the 2xCR123A/1x18650 space - but as with many of the lights I've reviewed recently, I think we need a little more tweaking of the interface (and perhaps the switch feel). Re: Tiablo A7 Review: RUNTIMES, BEAMSHOTS, DETAILED PICS and more! Great review as always! Thanks. But have you changed your camera setup recently? Pics have been noisier on your last 3 or 4 reviews. Different camera or just high ISO? No offense, just wondering. Once again an excellent review! Should I add that to my A9, A10 and ACE collection? Selfbuilt, can you describe the stage memory in more detail? Say I turn off the light when it's in strobe, wait 5 secs and afterwards turn on it'll be at strobe. After I turn it off again - if I turn it back on within 1, 3, or 5 secs it'll go on at high. However if I wait 5 secs again...it'll be at strobe. Am I correct? This doesn't make sense. I can't see what use there would be given how I described it. Second question would be - you've done a lot of reviews. 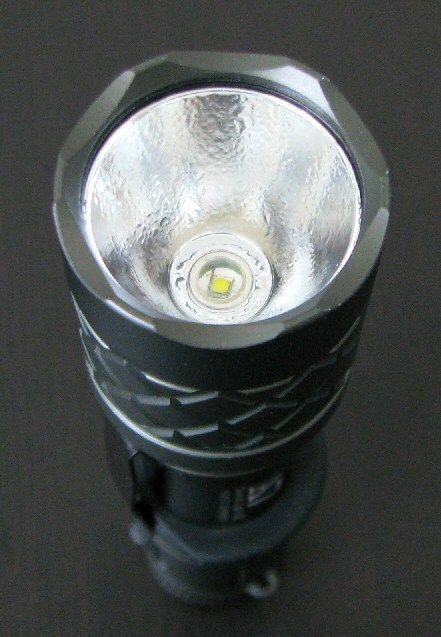 How do the flashlights with the 7 series aluminum generally compare with the others in terms of weight, heating-up and subjective ratings (feel, sturdiness, balance)? 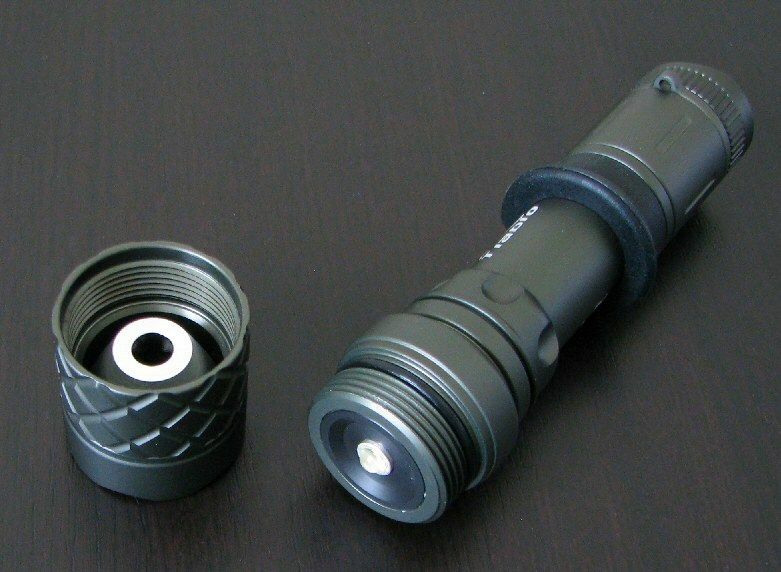 Would the crenelations on the bezel and the body of the flashlight be more impact resistant with a different aluminum? 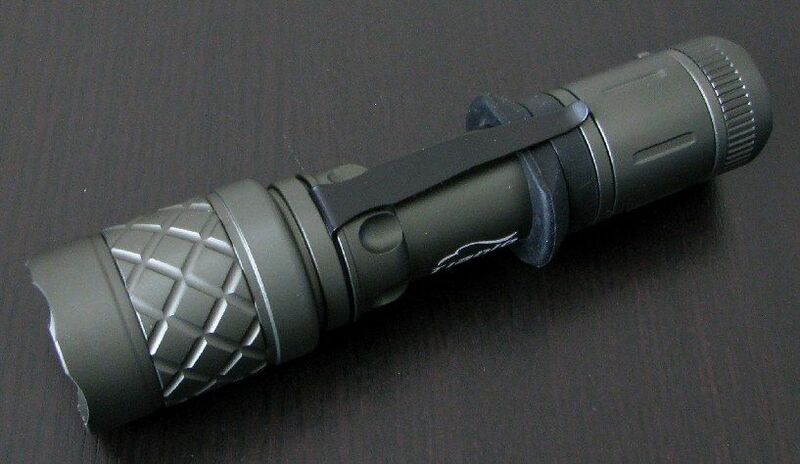 - is the tailcap cover the same as a Surefire scalloped tailcap//stand up to that abuse. Interesting looking light. I think I like the looks? It does seem to be lost though in the sea of offerings in this battery / emitter combination by all the manufacturers. I just don't see anything (feature wise) that stands out that would cause me to buy this over the M20 or Jetbeam Military. Which I'm still trying to decide between the two. Thanks for the review Eric. I always appreciate the information on new offerings. Thanks for the review! I was disappointed in the throw though. I believe the length (181mm) is a typo? But it does look longer than the advertised 132mm. 1) the ISO setting on my camera was knocked back to Auto in the mode I use for the desktop shots. I reset it on a recent trip, and forgot to set it back to a low ISO upon my return. 2) I've had a harder time finding sunny days to take my shots on (I haven't bothered building a photobox, and just take the pics on my desk near the window). With Auto ISO setting, this has likely meant a fairly hi setting. 3) normally, I play with the images in paint shop a bit to smooth them out before resizing - but have been too lazy lately given all the reviews I've been doing. Basically, yes - this is fairly standard for multi-stage lights with a memorization delay (and why you have to be careful to not re-activate too quickly, or you risk advancing out of your favourite mode). But I just realized that the memorization delay is much shorter than I previously thought. During that time when there is a lag in re-activation, the light actually comes back on in a saved state (i.e. not advancing forward, as I previously reported). This means that it is memorizing it earlier than I realized. And after getting out my stopwatch, I realize this lag time begins within ~1.5 secs after shut-down (not closer to 3 secs as I previously thought). So, in essense, the memorization occurs <2 secs after shut-down. I have revised my explanation in the main review - I hope that is clearer now. That's a good question. The best way I can describe it is that the higher 7 series aluminum doesn't feel as "soft" as the 6 series or lower grades. The 7 series aluminum also feel subjectively "lighter" to me. It's hard to explain, but the combined subjective impression is almost like this material could be more "brittle" but less likely to get dinged or banged up. I don't know if that's the case, it's just a subtle relative hand-feel difference. I haven't subjected the lights to any abuse to know - and all lights are of sufficient thickness that I'm not expecting any problems. As for throw, it is rather toward the low-end for this class of light (and certainly this size head). 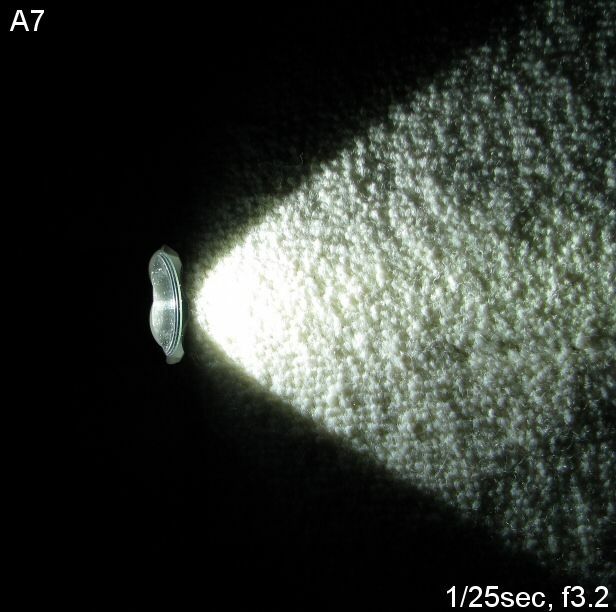 But the A7 reflector isn't very deep for its diamater - which explains the wide spillbeam and limited throw. This is different from a lot of other lights with this diameter head that went for a deeper reflector (producing a narrow spillbeam with more throw). Think more Quark-style "flood" than Raptor-style "throw" here. Last edited by selfbuilt; 09-09-2009 at 08:23 PM. But the A7 reflector isn't very deep for its diamater - which explains the wide spillbeam and limited throw. 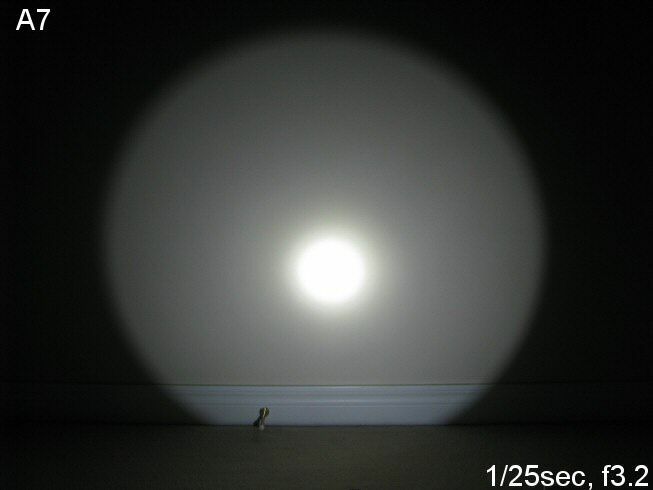 This is different from a lot of other lights with this diameter head that went for a deeper reflector (producing a narrow spillbeam with more throw). That's actually one of the things I liked about this light. I prefer lights with wide, smooth spill. Unfortunately, I have to agree with Hitthespot; it's a nice looking light with a few nice features, but there just isn't anything about that says "buy me!" I gotta say thanks for the review and the replies. I suppose the momentary mode is unavailable on mode b? I've got no use for the stage memory or the delay, so I'll pass on this light for now. Who knows, Tiablo might tweak the interface at a later date. Thanks for the reviews, great job again! The Jet-III M and Olight M20 have both been around for almost a full year now ... what's taking you so long? Seriously, I understand where you are coming from. Those two lights were really the first true heavy-hitter "tactical" lights from the made-in-China group to really gain traction here. Now, there are all kinds of options from various manufacturers, with the A7 being the latest player. What differentiates the A7 in my mind are largely the build features and beam profile. I agree its not likely to be enough to get someone to jump on it as a must-have, but it does give you (yet another) choice when trying to pick a light in this fairly crowded marketplace. I should point out that it also has the best regulation on Hi on 18650 for a multi-power light in this class (i.e. over 90 mins flat, before entering direct drive). Not an issue for me, since I'm happy enough with direct-drive from the start in this state - but for those who want flat regulation for as long as possible, the A7 is the best choice I've seen so far. I have yet to find the "ideal" interface for one of these lights (although the Jet-III M is pretty well suited for my preferences). That's right - momentary mode is really only available in Mode A (i.e. single-stage Hi). It works great there, as it is designed to do. Multi-level lights only work for momentary when the switching mechanism is done completely separately from the clicky (e.g. Olight M20, when you twist the head to switch levels). It looks like my guess that the activation delay was caused by the mode-switching behavior of the circuit is correct. Tiablo has confirmed that the simplest way to reliably switch between modes A & B is to insure 5 individual clicks are clearly registered during this pause period (i.e. 3 on/off flashes). I have revised the UI description in the review to (hopefully) make this clearer. There's a discrepancy between the manufacturer's weight specs and the weight specs reported. It'd seem more like 130g including batteries and close to 115 without. Hmm, I'm away from my office for the next two weeks, so don't have the light on hand to re-test. I'll double check the weight when I get back. Last edited by selfbuilt; 09-25-2009 at 08:28 AM. 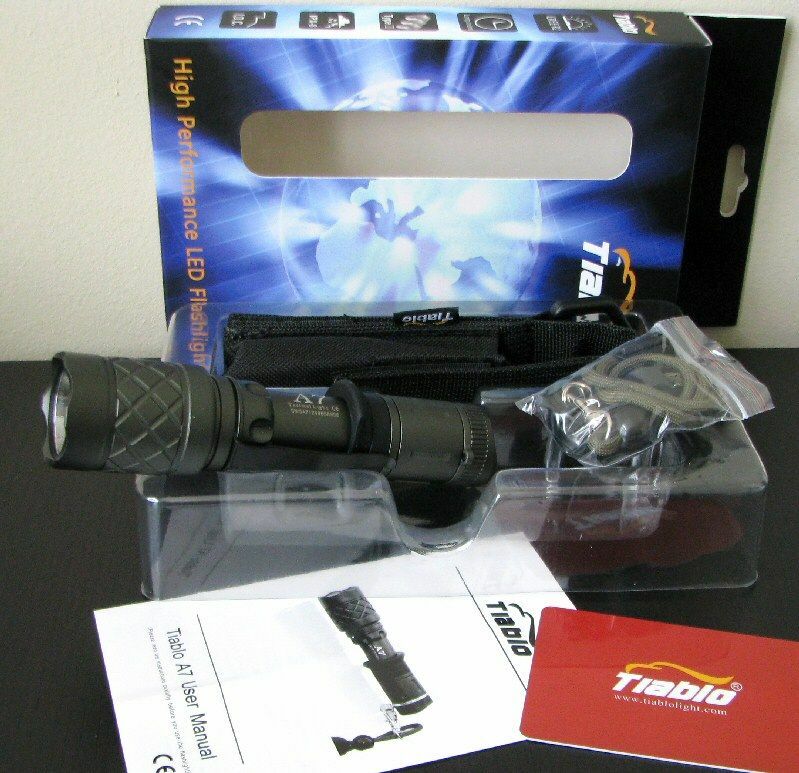 The light I saw and tried is exactly like that pictured in this review, I wonder what happens to the one pictured in their annoucement thread in cpfmp? Why change the silver coloured ring to one matching the body? I was hoping to get one pictured in their cpfmp thread... disappointed, really. Built is good, the thread at head and tail is very smooth and feels solid, and that's without any grease or lubricating agent. I would say it's on par or better than SureFire's. Good point about the lack of lube - the same is true on mine, but I forgot to mention it earlier. But as you say, despite that the threads are quite smooth. As for the claimed runtime specs, well, that's where independent testing comes in handy. I think the results above show that the A7 is an excellent performer at its output levels, with circuit efficiency mirroring that of EagleTac. Sorry, I'm away from office for next week or so, and don't have the light with me to verify. But the holster isn't anything so unusual (stiched heavy-duty nylon, with closing flap - which may be velcroed, can't remember off-hand). You can some of it in the first pic above. Sorry, I usually label that right in the graphs - all my runtimes are done on 2200mAh. I would expect proportionally greater runtime from the 2600mAh variety, but I have no direct experience of any 3000mAh cells. thank you selfbuilt... now, that 4-hour is starting to make sense. They use Panasonic 2900mAh unprotected cells. phantom23, thanks for the info. will search online and ask my local supplier if can get these Panasonic cells. I just retested the light, and I get the same reading - 113.4g with no batteries installed. With a pair of surefire CR123As in there, I get 146.3g. The manufacturer's literature claims this light to have an undervoltage warning, which would make it safe for use with unprotected cells. Does your sample have this fuctionality, and if so, at what approximate voltage does the cut-off occur? I'm interested in this light as a host for the unprotected flat-top 18650s I've been collecting from scrapped laptop batteries. Re: Tiablo A7 Over-Discharge Protection? Good question - but you will have to check with Tiablo directly for an answer. As is common on multi-power lights, the protection circuits on my 18650 cells were not triggered on either output mode. Can't say I recall seeing any signs of the low voltage warning flash on either of those runs, and I ran them past the point where you would notice visible light dimming. The only place when I did notice the warning flash was when I put in a couple of partially depleted primary CR123A cells. If your cell-protection circuits were not triggered, then I suppose it's reasonable to assume that the batteries were never drained to 2.4 volts or below, even with "noticeable dimming". Do you think, since the cell-protection circuits were never triggered, that they would be unnecessary by virtue of the dimming alerting you to change cells? I'm looking for a good 18650 light that doesn't need protected cells.